Artist's concept of the NASA/ESA ExoMars 2016 spacecraft in flight. It consists of the Trace Gas Orbiter and a lander called the Entry, descent and landing Demonstrator Module (EDM). Officials in charge of Europe's ExoMars rover, part of a joint Mars exploration project with Russia, say they are confident the life-seeking robot will reach the Red Planet's surface despite Russia's record of star-crossed Mars missions. Russia is in charge of building the rocket-powered landing system for the rover, which is designed to search for signs of past and present life on Mars. The ExoMars rover will also drill up to 6 feet (1.8 meters) beneath the rust-colored Martian soil and look for biological markers encased in the planet's bedrock. There, the markers would be protected from the damaging radiation and chemical processes present at the planet's surface. "This latter mission remains unique, and when it's launched in 2018, it will be a major innovation compared with anything that's happened to date on the surface of Mars," said Jean-Jacques Dordain, director-general of the European Space Agency (ESA). ExoMars has overcome technological, political and financial problems since ESA's member states approved the program in 2005, but hurdles remain. 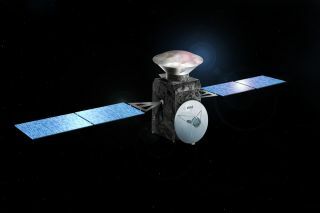 ESA has not yet secured full funding for the two-mission program, which saw its cost spike when NASA pulled out of the ExoMars project in 2012, with the American agency citing its own inadequate budget. NASA had promised to provide two Atlas 5 rockets to launch the European-built orbiter and rover, plus a "sky crane" landing system based on technology used on the Curiosity rover mission. With NASA's retreat from the program, European officials turned to Russia. Roscosmos, the Russian space agency, will launch both ExoMars missions on Proton rockets from the Baikonur Cosmodrome in Kazakhstan, and Russia also took over NASA's role in building the rover's all-important entry, descent and landing craft. But Mars has not been kind to Russia historically. Since achieving the first soft landing on Mars in 1971, Russia has never repeated the feat. The country's last two attempted Mars missions never got beyond Earth orbit. "That is why they are coming with us," joked Vincenzo Giorgio, vice president of exploration and science at Thales Alenia Space, prime contractor for ESA's ExoMars missions, speaking about the Russians. "They become lucky with us." In addition to the rover, ESA is responsible for the 2018 mission's carrier module and significant components of the descent system that will guide the rover through the Martian atmosphere to a gentle touchdown. "During the discussion, we told [Russia] we are not going to fly our rover on a brand new system," Giorgio said. According to Giorgio, Russia's rover landing design will incorporate elements of Europe's entry, descent and landing demonstrator, an immobile craft riding as a piggyback module on the 2016 orbiter. The Russians "will have their own descent module, but the shape is not much different from the one before, in 2016," Giorgio said. "The final landing system is not based on airbags. It will be based on landing legs, but the key sensors, as well as parts of algorithms for guidance, navigation and control, the radars and that kind of stuff will come from us." Europe is also developing a parachute for the rover, while Russia will fabricate the lander's metal structure and heat shield, supply the descent module's braking rockets and build the separation systems required to open the system's aerodynamic shell before landing, according to Jorge Vago, ESA's ExoMars project scientist. "We will have a rather strong cooperation with Russia," Giorgio said. "There is a lot of experience that will be gained in 2016 to mitigate the risks for 2018, in spite of the fact the descent module will not be led by Europe. It will be led by Russia." ESA also plans to tap into NASA's expertise in landing on Mars, said Jim Green, head of NASA's planetary science division and acting director of the agency's Mars robotic exploration program. Green said ESA has invited NASA experts to participate in design reviews and give advice to Europe, which itself has never achieved a successful landing on Mars. NASA's contributions will be subject to arms trade restrictions, which classify some space technologies as military munitions. "We stand ready to lend our expertise and help in any way we can to help ESA get to the surface of Mars," Green said. NASA remains a junior partner in ExoMars, having committed only to helping the mission with communications support through an Electra relay radio and by furnishing parts for an instrument on the rover that will analyze soil for organic constituents. Once the rover is on the Martian surface, controllers will activate the solar-powered robot and command it to drive off of the Russian landing platform to begin its six-month primary mission.